Lady MacRobert and her three sons. Here is a story of fortitude for you! 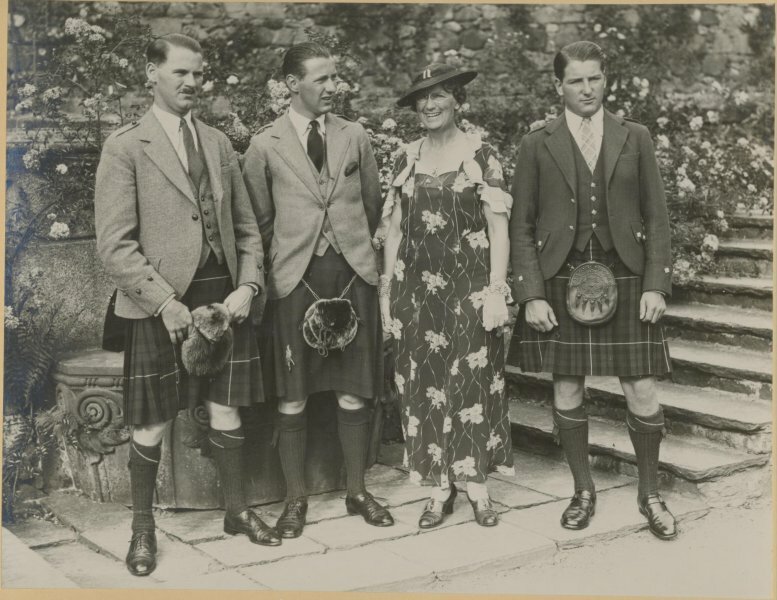 Upon the death of her three sons who had served in the RAF, Lady Rachel MacRobert sponsored a Stirling Bomber to be built and named "MacRobert's Reply." "It is my wish, as a mother, to reply in a way my sons would applaud - attack with great fire power, head on and hard. 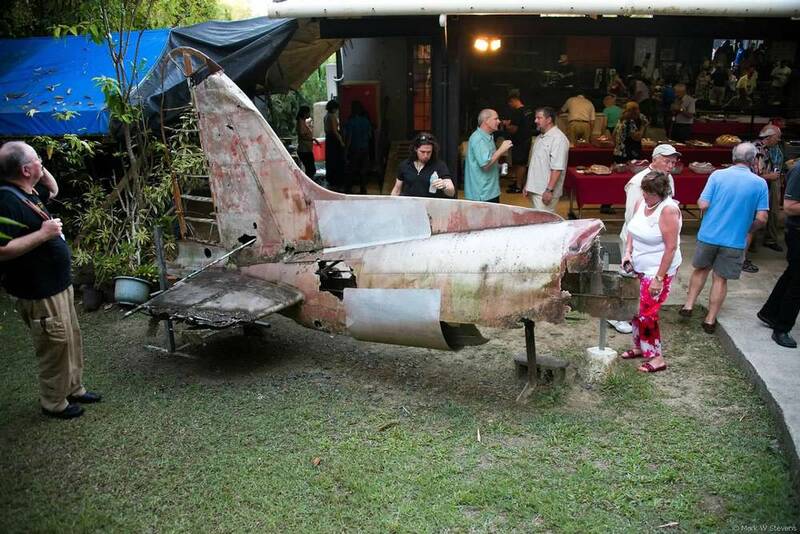 The amount of £25,000 is to buy a bomber aircraft to continue my sons' work in the most effective way. This expresses my feelings on receiving notice about my sons … Let the bomber serve where there is the most need of her and may luck be with those who fly her. If I had 10 sons, I know they all would have done service for their country." Lady MacRobert is a magnificent example of the indomitable spirit of the British people during World War Two. Many people come into your life. More go out of it. And a few of them touch your life in ways you couldn't have dreamed. George Cattelona is one of the few. Anyone who ever met Mr. Cattelona knows what a character he was. One of his favorite sayings was, "I always try and give em' hell where ever I go." But for all his joking around, he had the rare and beautiful quality of true kindness and genuine sincerity. Visiting with him at reunions over the last couple of years and getting to know him better each time, whether it was killing a few hours in the hotel lobby waiting for his car to be repaired or galavanting about the MCX at Camp Pendleton, these two qualities of his became apparent and touched our hearts tremendously. 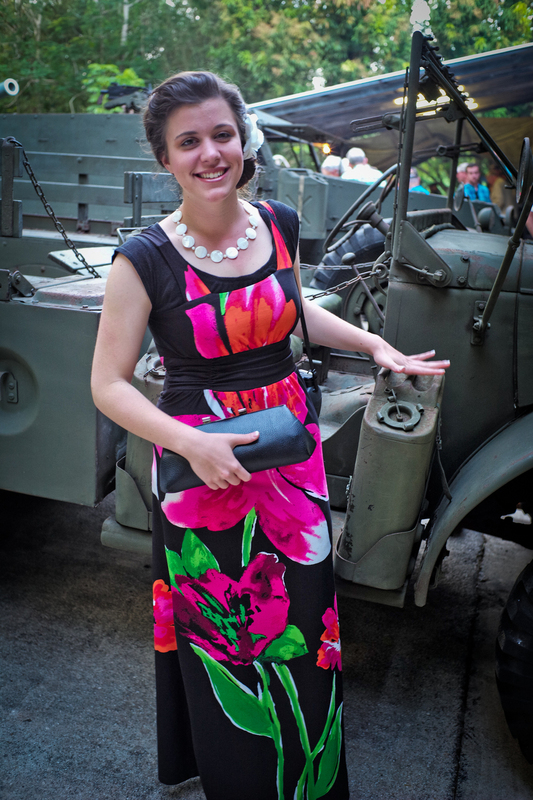 Virginia Beach 5th Marine Division reunion in 2015. George and his war buddy, John Coltrane. The girls and I fondly called him our "Prospector." He may have been born in the 1920s, but there was an almost intangible aura about him that seemed to come from another time. He saw hard things on Iwo Jima. His before and after portraits taken during his time in the Corps give that away. It was difficult for him to talk about Iwo, nevertheless he did because it was so important for his buddies to be remembered. He was absolutely devoted to their memory. I know the last few months following his accident were really hard for him. Mom and I were able to visit him in late May, and it broke my heart to see a man who was everything the Marine Corps stood for, everything that is American, noble, brave, and true, suffer so. Just a few months ago it seemed he would go on forever. And now, to hold his beautiful hands, look into his eyes and only see confusion in them; to listen to him talk about the men he served with on Iwo Jima as if they were still there, and to give him answers to his questions that only made him more frustrated. It made me cry. I didn't want to say goodbye and have that be my last memory. During our last visit, like a break in the clouds on a stormy day as if in answer to my prayer, for a few minutes that old familiar twinkle, (slightly ornery, slightly mischievous), came back into his eyes as he cracked a few jokes that only the George Cattelona I knew could make. He pretended to be annoyed that we were holding up his lunch, but the smile curling up from under his moustache gave him away. There's so much more about him I've left out. Losing him is hard. Harder than I imagined. In his passing it feels like a world of knowledge, wisdom, love, kindness, and sincerity has passed with him. We'll always love you Mr. C.
Look closely at the photo... The soldier next to the one carrying the flag is one of our Wounded Warriors, making the march with combat boots and a prosthetic leg. Absolutely inspiring! Like the bomber’s roar…like the canon’s boom. To stop! To listen! To understand! To pulse our hearts to the weary beat. . .
Advance. . .retreat. . .advance . . . The weekend is well over. The race completed 26.2 miles in blistering heat, and 22 of the 26 miles were in the most impossible sand surrounded by 7,200 incredible Americans who trudged the intense course, most of them in full military gear with a 35+ pound ruck pack, all to pay honor to the brave and heroic men of Bataan. Even now as I am collecting my thoughts on this past weekend, I am overwhelmed by the incredible honor it was to endure the brief and passing discomforts of a 26 mile march/run so that the sacrifices of the men of Bataan would be an everlasting memory. There are so many stories to tell that it’s hard to know where to start. There is little doubt that this was the hardest physical thing I've ever done in my life. It was a 26 mile up-hill battle against sand, dust, and wind, with the necessity to pause every mile or so to dump out loads of rocks and desert gravel from my shoes, muscles cramps, blisters, back aches, 90-degree temps (which even for a Texas girl can be difficult when it's reflecting directly off the sand), a vast desert emptiness with each mile marker more a reminder of how much more there was left rather than what had been accomplished, and the ever-endless line of marchers wrapping around the mountain as far as the eye could see. We truly looked like a ragamuffin bunch. As I was taking everything in, I realized the potential it had for being an incredibly depressing sight, with the feeling of hopelessness the men of Bataan must have felt on their dreadful march. Of course, theirs was truly desperate. But on the other hand, this memorial marathon could also be seen as a deeply inspiring sight. The fortitude of man and the ability we have to push ourselves beyond expectation never ceases to amaze me. And here were thousands of Americans willingly making an extremely arduous march, not for any machismo of themselves, but for the purpose of honoring the memory of Bataan and America’s KIA. Who can complain or resist feeling inspired when you look around to find yourself surrounded by thousands of Americans and American soldiers, burdened by enormously heavy packs, some of them in unbelievable pain from leg cramps and the heat, marching forward nonetheless without complaint, one foot in front of the other, never quitting or even considering it! If that were not enough, just wait until you pass a group of our Wounded Warriors; watch them march through impossible sand with a prosthetic leg or two, or proudly carry the American Flag with a metal arm. Nine times out of ten, you’ll see pinned to the back of their jersey, camel-back, or ruck-pack a neat little photograph or bib bearing the name of one of our brave KIAs... from WWII to the present. There is glory in such defeat. For mother, brother, friend and wife. When “Bataan” is uttered by any tongue. What happened at Bataan on April 9, 1942 was one of the greatest tragedies in American history. Next to the surrender of General Robert E. Lee at Appomattox, 77 years before to the day, America had never turned over so many men into the hands of the enemy. Had they known the horrors that would shortly happen at the hand of the Japanese, would they have fought to the death rather than surrender? As the minutes turned into half-hours, the half-hours turned into hours, and the hours into more desert hills, I started to see in my companions glimpses of the 75,000 Filipinos and Americans back in 1942 on their march. Of course, Sunday’s marathon doesn’t begin to compare to the Bataan Death March, but it offered the tiniest taste of what happened. You find yourself imagining their mindset, the nuances and the ticks of what would keep an American POW - worn out by months of hard battle, little food, and much sickness - what would keep that man moving, enduring, even cracking an occasional joke? Is it that fierce American quality birthed by our Forefathers? An indefatigable spirit to persevere, even carrying a falling brother, a resilience and inner strength to defy being conquered by our enemies? Whatever the case, speaking for myself, and probably the other 7,200 marchers/runners would agree... even the very small taste we got is one we won’t be forgetting quickly. More than ever, I am grateful to my great-great Uncle Israel for his sacrifice, and the sacrifice of every single one who gave his life during WWII. We will never understand fully what we were spared by the price they paid. Unlike them, at the end of the day, I got to take my shoes off, shower, eat a huge meal, drink all the water I wanted, and have a good night's sleep; while they remain in their cold, cold graves, buried somewhere at the Manila American Cemetery. We can't thank them in person, but we can thank the ones who are left on their behalf and in their memory. This March was a very small way of thanking them and showing them honor where honor is certainly due. I hope my uncle, his buddies, and the men and boys of Bataan would be pleased to be so remembered. And carry the battle to stricken lands. Work and sacrifice, hope and give. Dare to forget it . . .if you can! WE LOOK FOR SHIPS, BUT SEE NO SIGN. THE GENERAL SIGNS, SILENCE HE HEARS. AND START OUR MARCH, OUR MARCH THROUGH HELL. OUR ONLY HOPE, OUR GOD WE PRAY. THEY FEEL A CLUB AND A BLADE OF STEEL. THE DEAD NOW STILL, NO MORE THEY WEEP. NO MORE THEY PAIN, THEY’VE SEEN THEIR HELL. AND PRAY FOR US, FROM FAR ABOVE. THESE SCARS WE BARE, WILL NEVER FADE. WE’LL NOT FORGET THE PRICE THEY PAID. The Bataan Memorial Death March is upon us. Day after tomorrow, the girls and I head down to White Sands, New Mexico where we will listen to lectures on The First Battle of the Philippines, talk with family members of the soldiers who fought there, and meet the survivors of the horrible, horrible event. This is a dream come true. And the excitement must be high because I'm beginning to lose sleep over it. In a good way. One of the great discoveries of the last year, in relation to my uncle, was meeting Mr. Long, one of the veterans who attends the monthly luncheon in Fort Worth for WW2 vets. I mentioned it in a post here: Connections to my Uncle Israel Goldberg. Turns out Mr. Long was Aviation Mechanic with the 19th Bombardment Group, stationed at Clark Field, Philippines, the day Pearl Harbor was bombed. Just a little ways away serving in Headquarters section of the 24th Pursuit Squadron was my great-great uncle, Israel Goldberg. Both Israel and Mr. Long no doubt experienced the same shock of hearing the news about Pearl Harbor, followed by the awful attack on Clark Field. Our forces gave a stout defense, but to no avail, and in the end, the Philippines fell into the hands of the Japanese. Mr. Long managed to escape with some of his unit in late December, but our uncle was taken prisoner (along with 75,000 other American and Filipino defenders) and survived the Bataan Death March only to die in the Japanese POW Camp Cabantuan a few months later. In prepping for the race, I found the above photo... All I can say is it immediately brought the tears to my eyes knowing my great-great uncle would have been in this parade had he survived. As I've said several times before, a life-long dream has been to meet and talk with one of the survivors of Bataan. For a while, it seemed like our friend Mr. Long would be the closest we would get to knowing and understanding what our uncle went through. That and reading books. Actually, over the years I was in contact with a few survivors' wives, but unfortunately, the veterans passed away shortly before we could meet. But after all that, it looks like this dream might finally come true as a few of the last survivors of Bataan plan on attending this memorable event. You can be sure we will have lots of stories and photos after the race. If you want to keep updated until then, you can follow us here: https://www.facebook.com/OperationMeatball. On this day every year our thoughts and hearts are full as we think of the brave lads who took part in the invasion of Normandy. 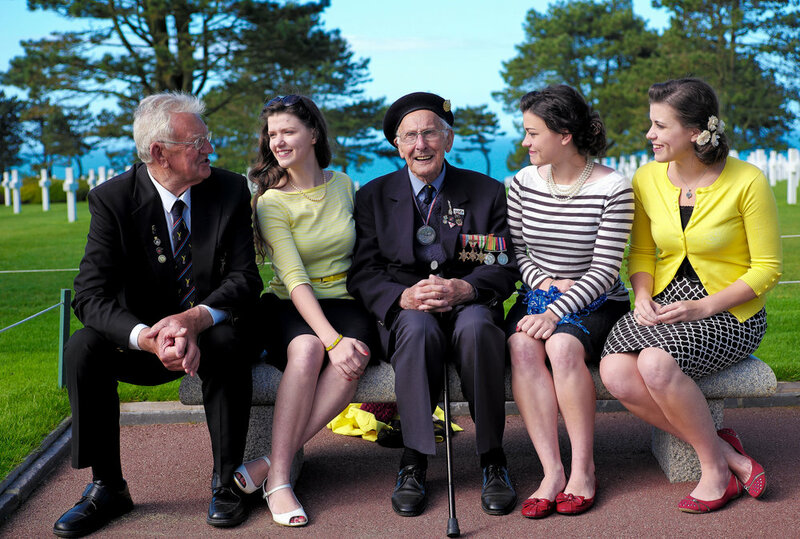 We have many friends who landed on the beaches, scaled the cliffs, or were dropped in by C-47 all in the early hours of June 6, 1944 and are now here to tell the tales of bravery and sacrifice of their comrades. But we also have many friends who did not make it. Some of them went through months of hard training only to be killed moments after landing. They are now buried in the beautiful yet somber cemetery off of Omaha Beach. This may seem strange to say since we are separated by 72 years, a full lifetime. But reading of their stories, learning about their lives growing up on the farms out west or in the emigrant-crammed cities of the east we feel like we know them; that they are our friends. When we talk to the men that were right beside them as they took the bullet that would put a gold star in a mother's window, we feel like we have lost a childhood friend. Tears come to our eyes as we realize the only son of an emigrant family won't come back to carry on the family name in the land of opportunity that his parents dreamed about all their lives. Handsome Frank Draper, brothers Bedford and Raymond Hoback, and 17 other friends from the same small town in Virginia, all killed in the early hours of DDay. They never knew us, but we know them. They were our friends, and we will never forget them because their names are etched in our minds. D-DAY is a solemn day, but also a joyous day. Because of the sacrifices made that day, giving the allies a foothold in France, the hope and freedom of all of Europe was secured. "Did you remember the sarge and the gunners mate?" Last year in my Memorial Day post I mentioned a Navy Corpsman name Bert Cooper, and how he never forgot the sacrifices of two particular men who died during the Okinawa Campaign. It is such a moving story, and so perfectly sums up the reasons for why we have a Memorial Day, that I thought I'd share the story again in his own words. I remember one thing vividly about my service. On Okinawa [there was] this big ugly Marine (I swear he was uglier than Ernest Borgnine, who was a good actor, but an ugly actor), he was tough and muscular, and built like a tank; and his men loved him. We had him as a patient and he called me over to his stretcher in the tent there, and he says, "Doc, I don't think I'm gonna make this one." I said, "Oh come on, we never give up." He said, "I know. I just feel it in my body. I'm not going to make it this time." (And he'd been shot up several times on other island campaigns). And he says, "I wonder if anyone will remember me." So I looked him straight in the eye and I said, "I'll remember you Gunny. I'll remember you the rest of my life, I promise you that." So he died that evening. Across the tent was a young sailor in a stretcher also. And he called me, "Hey Doc." He could hardly talk, it was only a whisper. About the only thing pink you could see were his lips. He was in a gun tub with eight other guys, gunnery men. And it got hit by a kamikaze and killed all seven, he was the only survivor if you can call it a survivor. When we got him he was black as this mic here. And we knew he didn't have much time left. But we kept him going for about a day and a half, and everything we could do... And it was amazing, the doctor even said he didn't know why he didn't die instantly from all these burns. So he calls me and I kneel down to his stretcher. I say, "Yeah gunner". And he says, "Doc, I'm an orphan. Who is there that's gonna remember me?" I says, "I'm gonna remember you. I'll remember you every day of my life. I promise you that. I'll remember you." To this day, every night I ask myself when I pull the covers up to my chin, I say, "did you remember the sarge and the gunners mate?" And 99 times out of a 100 I thought of them during the day, and once in a while if I didn't , I go to sleep saying, "I thought of you guys." And I've been doing it every day since. It's not a burden. It's a testimonial to what men will do or have to do to save the freedom for the rest of us. This is the true meaning of Memorial Day. Thanks to Bert Cooper, those two brave men will never be forgotten. The other day I made two happy discoveries related to my great-great uncle Israel Goldberg. As Memorial Day approaches, his death at Camp Cabanatuan in 1942 has been much on my mind. This afternoon at a monthly WW2 veteran's luncheon, I spoke with a veteran who was stationed at Clark Airfield in the Philippines right before Japanese bombed Pearl Harbor. I told him that my uncle Israel was stationed at Clark at the same time. Though with a different group, my friend was quite familiar with my uncle's squadron group and could tell me about a bit of what they went through before the Philippines fell into the hands of the Japanese. The same day, and shortly after, I spoke with another veteran who said that while he was stationed in the Philippines in 1945 he was called up for a very special duty. For an entire day he participated in the honor guard's final salute for every single man buried at the American War Cemetery in Manila. My uncle's remains would not be transferred to Manila until sometime in 1947, but I felt a bit like this final salute would have included him as well. I have known both these veterans for a while, but had never yet made the connection to my family in this sense. Especially with the first one, it is probably one of the closest linkages I've been able to make to my uncle before the Bataan Death March. How appropriate to make this connection in honor of my uncle just in time for Memorial Day. 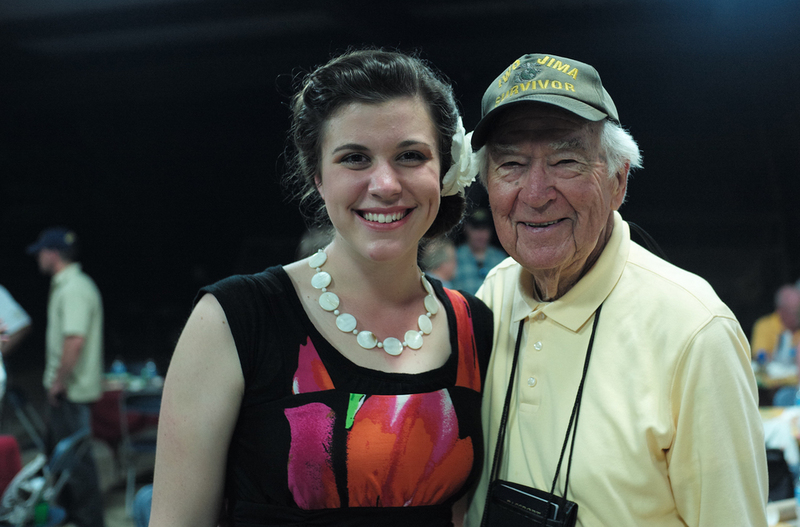 “What does returning to Iwo Jima after 70 years mean to you?” I asked a 90 year old, soft-spoken Marine. He started to tell me, then stopped. We were on the top of Mt. Suribachi overlooking the island of Iwo Jima. With his good arm, he had just pointed out to me the location of his landing beach and subsequent movements. At his side hung a limp prosthetic arm, a memento of the 12 days he had spent on the island. “Give me a minute.” He said, his voice choking a little. He looked back over the island, trying to get control of the emotion in his throat. After a few moments of silence, he started to speak again, but his voice cracked. “I’m sorry. I can’t tell you. It’s too...” His hand instinctively went to his prosthesis. “It’s okay.” I told him. Without saying a word, he had expressed everything. The morning we departed for the island of Iwo Jima, we left our hotel on Guam at the unrighteous hour of 3 or so o’clock in the morning. Most the folks on the trip (self included) had only enjoyed 2 or 3 hours of sleep, but excitement and anticipation proved to be a good enough antidote. In the airport, we were joined by the rest of the crowd, all in all totaling about 450 people (3 planes' worth). During the flight, I turned around to introduce myself to the two veterans behind me: Sam Weldon, 4th Division, a real brass-knuckles Marine; and Frank Pontisso, 5th Division, much more soft-spoken than his companion. They both came from way up north, their accents betrayed. For both of them, Iwo was their first and last combat. Mr. Weldon came off the island relatively unscathed, with the exception of almost complete loss of hearing. He ended up as an MP on Guam. Mr. Pontisso was less fortunate. On his 12th day, a mortar blast exploded near him and two of his buddies. All three survived, but his right arm was badly damaged. With it packed on ice, he was shipped off the island. “Ladies and Gentlemen, in a few moments we will be approaching the island of Iwo Jima...” It was almost amusing to hear the Captain say this over the loud speaker. The usually dull, “Welcome to your destination,” was changed entirely by those two little words Iwo Jima. The plane circled the island three times before landing, so that all who wanted could cram into a window seat and grab a shot of this historic island. The island was beautiful. Not in the way the Golden Gate Bridge is beautiful to a sailor who has been at sea for many months, or New York Harbor was to the immigrants in the early 1900s. But beautiful in the haunting sense of the stories it holds, the bravery and courage unequaled, and a history that must never be repeated. I looked over at Mr. Pontisso in the seat behind me and couldn’t help but wonder what he was thinking. The last time he’d seen the island was the day he was hit by a mortar. Diving into a foxhole, a corpsman had given the wounded marine a shot of brandy before he passed out. The next thing he knew, he’d been taken off the island and hospitalized. Everything was going fine in his recovery, until gangrene set in. There was no choice but to amputate the arm. His war was over, and he was sent home with a Purple Heart. Mr. Pontisso looks out the window as we circle Iwo Jima, moments before landing. Now, 70 year later, he was coming back. I snapped a quick picture. It is strange that a piece of lava in the middle of the ocean can hold so much significance to us. Immediately after debarking, we headed up to Mt. Suribachi. From the top of Suribachi, we could view the entire expanse of the island; an impressive view, but not exactly the same view the flag-raisers had 70 years ago. Then, the surface of Iwo had been bombed to pieces and hardly a lick of foliage was to be seen on the island. Today, it is completely covered in greenery and can almost be considered lush. On top of the mountain, an exciting chaos was ensuing. Veterans and friends crowded around the Marine Monument for a photo, or raised their flag on the pole briefly, all the while dodging news cameras and photographers. I had to gulp and hope it wouldn’t go away too fast. Time did seem to halt a few times as I talked to a couple of the veterans coming back for the first time. They spoke slowly, carefully reflecting on their surroundings. One of them said that no matter how much you prepare to revisit the old sites, it still kind of hits you hard. The ceremony on Iwo Jima was formal. The representatives from both America and Japan spoke, followed by a wreath laying. Each side paid tribute to the men who died; they spoke of forgiveness and healing, and the unity between our countries. It is always striking to me to see two countries that warred so viciously with each other, make peace, and then for the next dozens of years became strong allies. Lt. General Stackpole, Lt. General Snowden, and Lt. General Smith lay the wreaths. Speaking of forgiveness, we had, with our Military Historical Tours group, a special guest: Mr. Tsuruji Akikusa, a Japanese Naval Radioman. Mr. Akikusa had aspired to be a fighter pilot, but his father, not wanting him to die, had him sent into the Japanese Navy. This would be a safer place for his son. But it wasn’t. Before long, 18 year old Mr. Akikusa ended up on the island of Iwo Jima. Through a translator, he described to us what it was like to watch the first Americans land on the island. In a small bunker near the beach, he saw the landing crafts approach, the marines unload and begin climbing the beach. There was no opposing fire. Quite anxious, he asked the officer next to him, “Why are we not firing? !” At that moment, the cannons erupted from the hidden bunkers and tore up the first Americans. Mr. Akikusa was relieved, but also horrified. Throughout the rest of the battle, he remained on the island, but never fired a shot. As the end drew near, many of the Japanese soldiers in his bunker committed suicide. Then it was evident they would soon be overcome. He heard shouts and cries and saw the Japanese officers shooting the soldiers who were crying in fear. Afraid that they would shoot him, he didn’t say anything. Soon, his bunker was hit, knocking him unconscious. A few days, later he woke up in an American hospital tent. He learned that one of the War Dogs had sniffed him out during a patrol. When the Marine accompanying the dog saw that he was still alive, he brought him back for medical attention. Mr. Akikusa was one of only 1,000 Japanese to be taken prisoner on the island of Iwo Jima. Over 22,000 Japanese soldiers had been killed or committed suicide. Mr. Akikusa spent the next year as a prisoner of war. Fearing his survival would cause shame for his family (who thought he was killed on the island), he never wrote home to tell them he was alive. It was one of the moral codes of their culture to die an honorable death in battle rather than suffer the disgrace of surviving, or worse -become a prisoner of war (This is one of the reasons the Japanese treated our POWs so poorly; they considered them to be disgraced men for surrendering). Eventually, after the war ended, he decided to go home. He arrived just in time to discover his school was having a funeral service for him and the other boys in his town who died during the war. He went quietly in, removed the picture of himself and sat down to attend the rest of the funeral. His funeral. Mr. Akikusa is an example of a man who once was our enemy, but now he is a friend. Some of the veterans on the trip were unsure about meeting someone they would have considered a bitter enemy. But putting aside enmity and deciding to forgive, they were able to shake his hand and welcome him as a friend. In response, Mr. Akikusa appreciates and respects our country for “rescuing” him. The polaroid instant from our meeting. After the ceremony, I saw that he was sitting alone with his translator. Walking up to him, I took his hand and told him how grateful I was for the peace between our countries and thanked him for coming with us - his former enemies - back to Iwo Jima to remember our fallen soldiers. He smiled so kindly and replied similarly. Pulling out my Polaroid, I asked to take a picture with him. If you remember Polaroids, they print instantly, so a moment later, I gave him one of the prints. He smiled when he saw the photo, and his translator explained to him that it was a gift from me for him. With almost tears in his eyes and holding tight to the picture, he thanked me. Following the ceremony, several of us piled into the back of a jeep and headed down to the beach. Getting to the sand was entirely different from anything I had imagined. You read about the difficulty the Marines had climbing the sandy embankments: move forward three feet, sink backwards and in two. It was impossible to dig foxholes for protection because of the texture of the gravelly sand which caved in and cut up the skin. It was all this and more. I mentioned that the sand was rough enough to cut skin. Hard to believe, but true. Coming up from the beach, I tripped and cut my knee. The cut was small, but 13 months later, I still have the scars from it. With such a small incident leaving such a permanent reminder, I couldn’t help but think about the poor fellows who crashed into the sand for protection or fell wounded. I’ve been calling it sand, but really it is volcanic ash; the same hard, rough, gravelly volcanic ash that greeted the Marines on Iwo 71 years ago. I'm here with my friend, Mr. G. and his granddaughter just after we've come off the beach. With evening coming, we headed back to the airstrip to fly back to Guam. We boarded our plane all in tact, carrying several additional pounds of black Iwo Jima sand. This sand was so popular that for a few minutes there was question if some poor soul would have to dump their portion to lighten the load of the plane. There were no volunteers and in the end everything was fine. Our flight back was uneventful (though two of the other planes ended up being grounded for a couple of hours before returning... Another story), and we chatted with the veterans and folks on the plane. Our trip was coming to a close. Mr. C. Burney signs my LIFE magazine. The cover depicts a blockhouse being blown up on Iwo Jima. 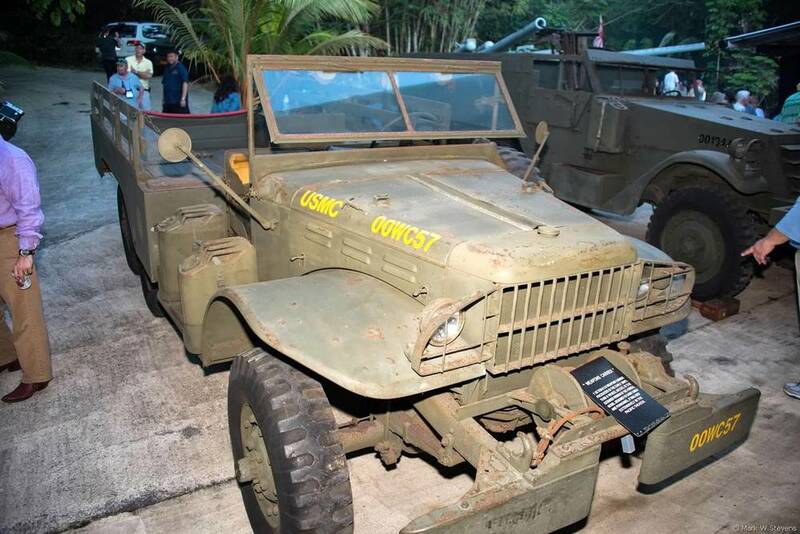 The next day was the last day of the tour, finishing up with the closing banquet at the Pacific War Museum, a fabulous museum in Guam that boasts excellent artifacts and tremendous military equipment (jeeps, trucks, guns) scattered around the grounds. 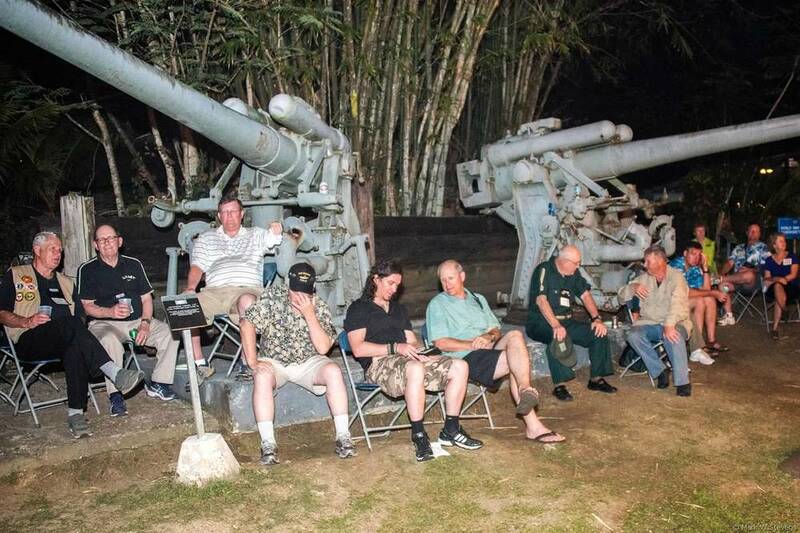 Nothing like enjoying your dinner at the base of a WWII anti-aircraft gun. This may seem like the longest article I’ve ever written. Probably is. Unfortunately, as long as it is (and if you have persevered through it thus far, bravo and thank you), only highlights were mentioned. So much happened in such a short space of time that it is hard to put it all down and get it out the door. But for now, here are a few lessons I learned from Iwo Jima. 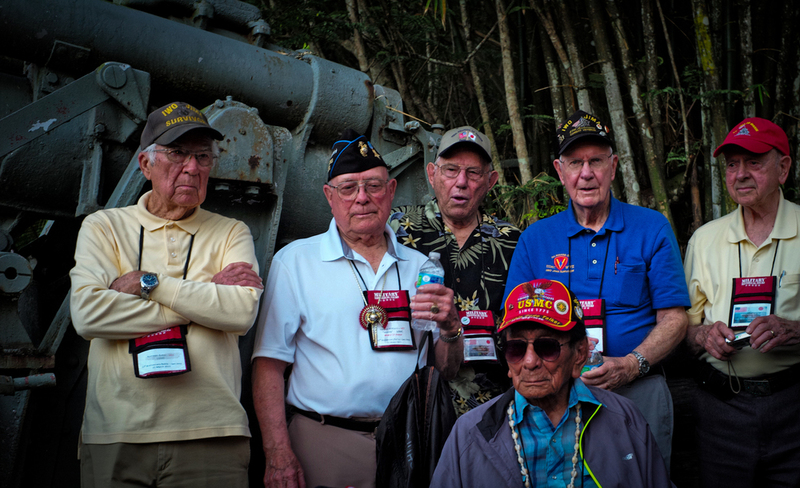 On this trip, I met veterans who had carried great animosity and hatred toward the Japanese for the past 70 years. Understanding that what the Marines on Iwo Jima experienced is beyond our comprehension, it is still hard to see men in their 90s continue to carry bitterness against their enemy when their time left on earth is so short, because bitterness eats at the soul like nothing else. But, even the most angry man can overcome and forgive. I saw that happen. He may have lost his arm 71 years ago, but to him, he came out with his life when so many others didn’t. He went back because it was important to him that he remember them and that others remember. The strength of the brotherhood was so strong that he and others were willing to put aside the personal pain of the memories and make one last return. One last Reunion of Honor. In an old war movie from the 1940s, White Cliffs of Dover, there is a scene at the end which always brings tears to my eyes. The young man, John, has been mortally wounded fighting in France during WWII. Lying in a hospital in England, he tells his mother about a conversation he had with another soldier. The interchange between the mother and her dying son pretty much sums up why we must never forget. A few moments later a parade comes by, and his mother looks out the window. The memory of the boys who died on Iwo Jima, where “uncommon valor was a common virtue,” mustn’t be forgotten. Neither should the boys of Peleliu, Tarawa, Wake Island, Guadalcanal, Monte Cassino, El Alamein, Normandy, the Hurtgen forest, the Battle of the Bulge... None of them. If we forget, what was the point of their sacrifice? So, thank you to all the young men who gave up their futures. The men who will be forever young in our memories. We may live to be 95, but they will always be 19 years old. God forbid that we ever break faith with them and, in our selfishness, forget the reasons we still live in a free country. 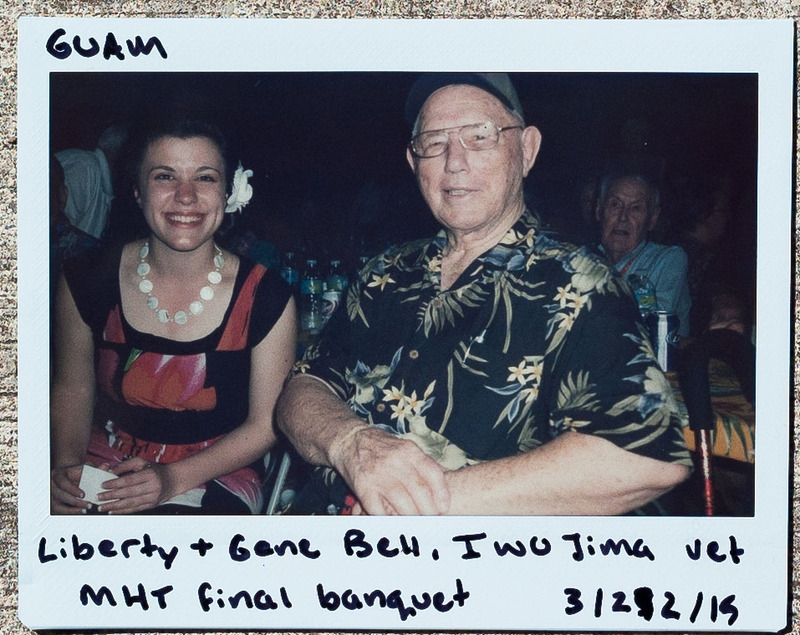 In March of 2015 I (Liberty) traveled to the Island of Iwo Jima for the 70th anniversary of the battle with a wonderful group of veterans including veteran James "Jim" Skinner. For one week I had the privilege of talking with him every day and hearing his wonderful stories from his childhood to his triathlons at 90 years of age. One morning we sat down and he showed me pictures from his wartime scrapbook. Pictures of his buddies during the war, girlfriends, training, military life, etc. 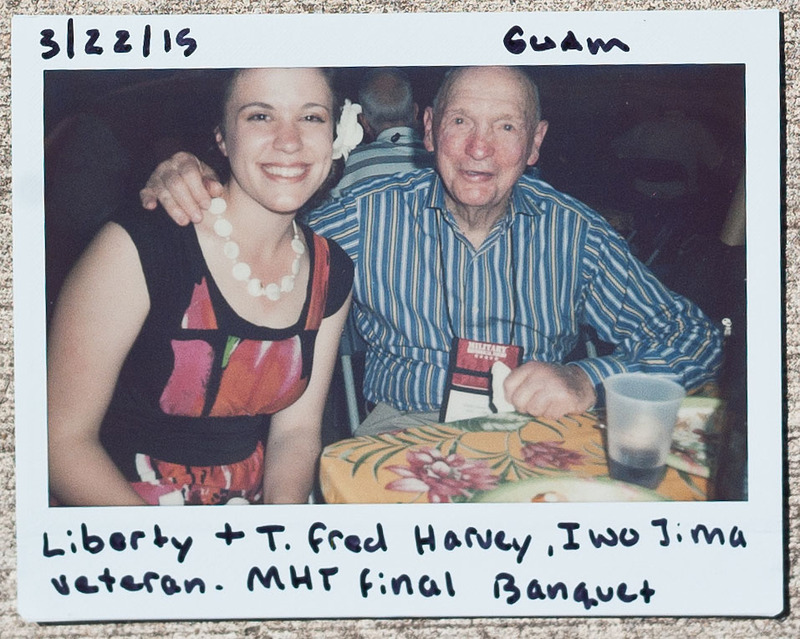 As we walked through these pictures, he told me stories of hand to hand combat with the Japanese on the Islands of Bougainville, Guam, and Iwo Jima, and showed me a photo taken moments before he killed for the very first time. He spoke frankly to me of the roughness and brutality of his war; a war in which many of his experiences caused him to hold bitterness toward the Japanese 70 years later. Mr. Skinner (center) on his way back to the beaches where he landed, 70 years ago. Last week I received the painful news that Mr. Skinner passed away on May 24th, 2 months after our trip, and just two days after his 93rd birthday. It was a privilege to have spent that brief time on Iwo Jima with him. A few days before our March trip to the island, our group learned that we were to meet one of the last surviving Japanese soldiers from the Battle of Iwo Jima, Tsuruji Akikusa. A pervading theme of this "Reunion of Honor" was forgiveness. After listening to the words of our trip leader, Lt. Gen. Snowden, Mr. Skinner resolved to put aside his bitterness to the Japanese and shake hands with Mr. Akikusa. Afterward, I asked him how he felt meeting his former enemy. He told me that he felt great peace in his heart to have reconciliation and forgiveness with a former enemy before he died. He had been bitter towards them for 70 years, and it was time to let go. For me to see this complete change in him over the course of a few days was one of the most beautiful signs of redemption and forgiveness I have ever witnessed. Mr. Skinner and Mr. Akikusa. Once enemies, now friends. "I'll hold the rose over my mouth to cover my missing teeth!" There once was a boy. He grew up and went to war. He didn’t know much about the world outside where he lived, but he went to war to protect his homeland. He trained hard to be a soldier, and one day he boarded a ship, crossed the English Channel, and landed on a beach code named Utah. It was June 6, 1944, D-Day. Weighed down by equipment, the soldier struggled to shore; bullets and machine gun fire striking everywhere. Within moments, war had become a reality. Continuing to fight on through the French countryside, he triumphantly marched into Paris, then up through Belgium and the Battle of the Bulge, finally Germany and home, carrying with him two purple hearts. He had started out the war as a boy, and finished as a man and a soldier. This is the story of hundreds of thousands of American boys who landed on D-Day. They differ accordingly: some from the countryside, some from the packed city; first generation Americans or those whose family had been firmly planted in the soil since the landing of the Pilgrims in 1620. Some of these stories finish on the beaches of Normandy, while others have still not been completed. But today, this is the story of Lee B. Cason. Like so many other boys who had grown up in the Depression, Mr. Cason joined the army at 18 to protect his country from the tyranny that was threatening all of western civilization. He believed it was a duty not to be questioned and was fiercely patriotic. Many times he told us his service during WWII was one of the greatest honors of his life. After training state-side, he was shipped overseas to England with the 4th Infantry Division. Training was brutal, but imperative to the success of the war. One evening while on ship off the coast of England, Mr. Cason was asleep in his bunk awaiting orders. He was awakened by a large thump to the side of his ship and heard a terrible grating. There was an initial alarm, but soon things became quiet again. Getting back to camp the next day, he was sworn to complete secrecy. It was only years later that he learned how close he nearly came to being one of the many casualties of the infamous Exercise Tiger on Slapton Sands. When I first asked him about this, for a brief moment, his face was crossed with the deepest sadness. He may not have known the names of all the lads that perished that day, but he had trained with them, and they were all his buddies; and their war never even started. As the beach drew closer, the small craft began to be riddled with bullets. It was a frightening moment. And then the ramp went down. A few months ago, I received a letter from Mr. Cason which included the cover of a book. The picture on the cover was of a landing craft on D-Day. "Liberty, my position was on the front of the landing craft (where someone is standing). This was not the landing craft I was on, but this is what it looks like. There was/is a ramp chain (out of sight) that part of my right boot caught and almost cost me my life. It eventually broke with tremendous effort. We were weighed down with about 80 lbs of equipment (40 lb mortar piece, ammunition belts (2), 4 8lb mortar rounds) and weighed down, of course, with water up to my chest (also a steel helmet and combat boots that were water-logged). " The weather was terrible,” he wrote, “as you probably know. BUT I made it though and now for combat on the beach and beyond. Whoopee? Not really! The whoopee part." My family and a very close friend met Mr. Cason last fall and just fell in love with this dear man. He delighted everyone with his harmonica playing (simply the best), and he told us stories of his war which were unlike any we had heard in description, detail, and even sound effect. A few weeks ago, my family and I were very heavy hearted to learn that this dear and precious man had passed into eternity. It came somewhat as a surprise to us, for no matter how frail he was, the life and vitality in him seemed unbounded. The friendship my family and my dear friend had with Mr. Cason could be considered somewhat unusual as we met him but once, and after that our only communication was through letters. But it was a beautiful friendship that sprung out of an unlikely conversation on a blustery day. I began by telling the story of one of thousands of American boys who landed in Normandy in June, 1944. One of thousands. It is easy to forget when reading history books that the massive numbers recorded are made up of individual human beings; each with a unique story, an entire life and soul. But it is true. And that day on Utah Beach, Mr. Cason was just one of the thousands, without a name as far as the Commander in Chief knew. But to us, he is now an individual with a story, representing all the other boys of Utah Beach and what they endured. His story and his life will never be forgotten. There are so many thoughts I have on Memorial Day: Of noble lives that never lived past their 21st birthday; of beautiful lives that have recently passed on to eternity, of the few who still remain; and of the memories that will be left when all are gone. I didn't used to think of Memorial Day, a day of remembrance, like that - partly because I was too little and partly because I just didn't understand. The truth is that we will never understand, but we can grasp at parts, bits, and pieces. My realization came a couple of years with the last WWI veteran, Frank Buckles. I had written a letter and was planning to meet him, if possible, but it was too late. Mr. Buckles passed away just a little after his 110th birthday, and just before I sent me letter. 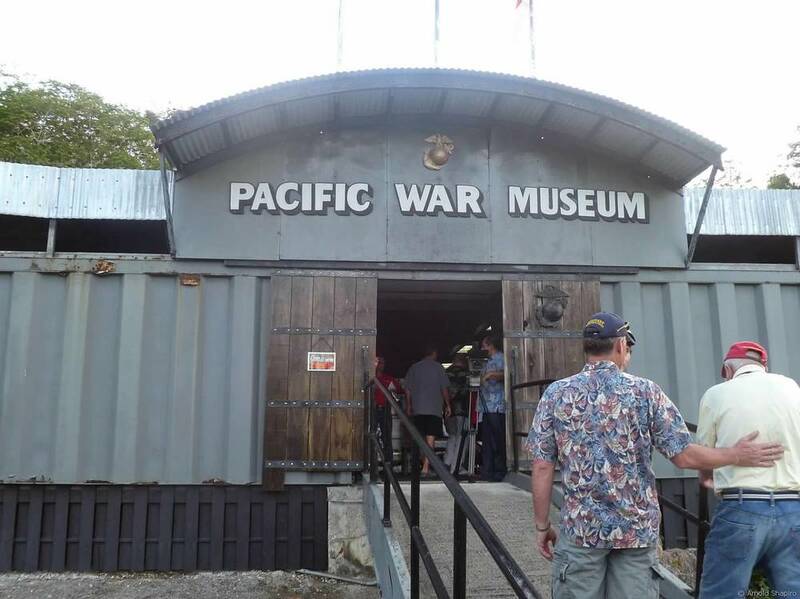 A few months ago, my family and I visited the National Museum of the Pacific in Fredericksburg. It must have been 10 years since we had last been there, and we were enjoying seeing the expanded exhibits. While walking through the section on the Battle of Okinawa, I pressed a button for short oral histories, not knowing what to expect, and what I heard was deeply stirring to me. Burt Cooper had been a medic during the Battle of Okinawa. One day he was taking care of a young Marine. The boy didn't have long to live, and both knew it. So, distraught, he said to Cooper, "I'm an orphan. I don't have any brothers or sisters. When I die, who will there be to remember me? Who will know what I did?" Cooper told him, "Don't worry. I will remember you." Across the aisle from the boy lay a Gunnery Sergeant, a "big ugly Marine who everybody loved." When Cooper came over to him, the Marine said, "Doc, who will remember me when I die. No one knows be back home. Who will remember me?" Again Cooper said, "Don't worry. I will remember you." Within a day or so, both the orphan and the ugly Marine died. Cooper finished his oral history, "Ever since then, not a day has passed that I have not thought of the orphan or the GySgt. And if I don't remember during the day, I think of them when I lie in bed at night." Thanks to Burt Cooper, those two brave Marines will never be forgotten. My dad wrote something for Memorial Day that was so perfect and beautifully written that I had to include it here. The Twilight Men: For some years now our family has lived in a world of twilight men - the sun is setting for all of them. They know this. That is why many of them are spending some of their last moments saying goodbye to friends they left behind more than seventy years ago. The names of those friends are etched in the stones before them. To the hundreds of thousands that look on these stones each year, those names are impersonal reminders of a battle that took place long ago. But to the twilight men, the sight of the etchings produce images in their minds of boys who were flesh and blood - souls of inestimable value. They can see their faces and hear their voices and feel once again a brotherhood shared in the midst of world changing events. Never forget. Never stop remembering. When you look to the future and plan what the next 10, 15, 20 years will be for you, remember this: that someone had to give up his future so you can live yours. This is a noble thing, and should not be forgotten. We just learned that Mr. Pat Engelberg, an incredibly energetic and remarkable veteran whom we met in Conneaut, Ohio this year has passed peacefully away. We are so grateful to have known Mr. Engelberg even briefly. At 99 1/2, he told us his key to long life was gratitude. We corresponded with him a little bit via email, and he had some amazing experiences to tell us, including meeting a civil war veteran when he was in college. 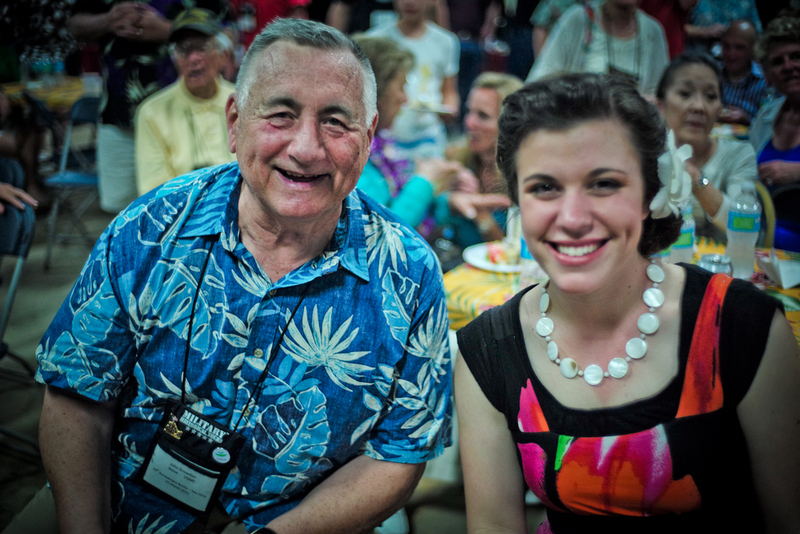 It was a great joy to us to know Mr. Engelberg, and we know everyone who met him was encouraged and inspired! Our heartfelt sympathy and compassion goes to his family. We mourn their loss and wish them comfort and peace. Three years ago today, I was under a great tent looking out onto the beautiful Bay of Pearl Harbor. Just a few yards from me, I watched a very dashing 89 year old man with his fiancee dancing to the music of the 1940s. Mr. Gery Porter, and his lovely fiancée. 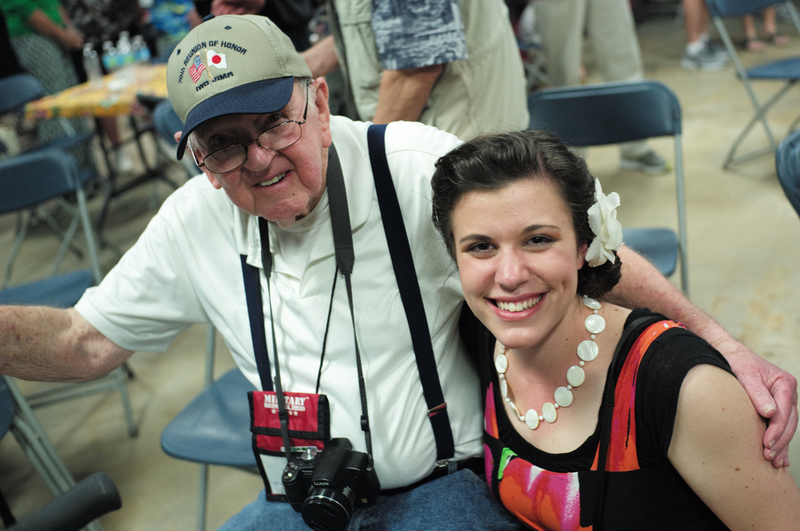 He later introduced himself to me as Mr. Gery Porter and shared his story as the National Secretary and Treasurer for the Pearl Harbor Survivors Association. His regret was palpable as he explained that this was the very last gathering because too many had died and the association had decided to disband. The next evening, my family and I watched Tora Tora Tora, at a special showing of the film, followed by personal accounts from survivors. 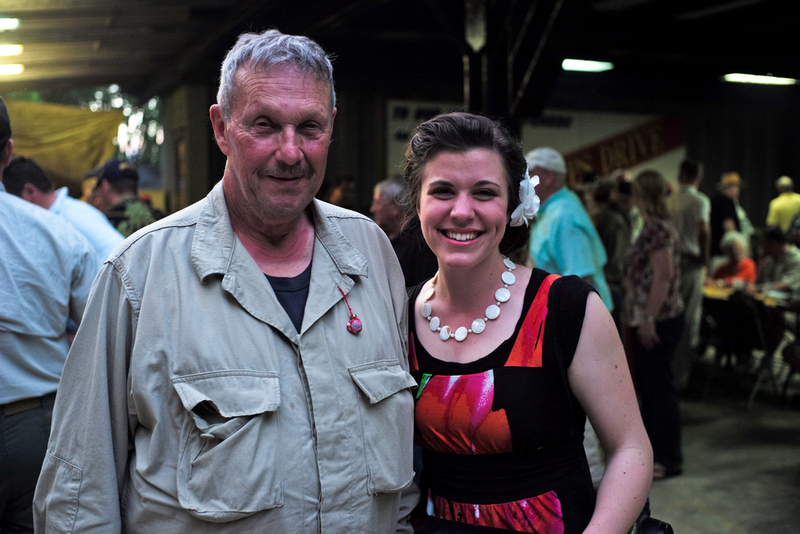 That weekend, we ran into our friend Zane Schlemmer with whom we had spent time earlier that year in Normandy. Faith sang one of Mr. Schlemmer's favorites, "We'll Meet Again". He was dressed in the uniform of the Second World War and was as spry and energetic as could be. He gave my sister Faith his Hawaiian lei after she sang to him, and she still has it, dried and framed, on her dresser. That same day we spent the better part of a very beautiful hour with Mr. Harold Dove. 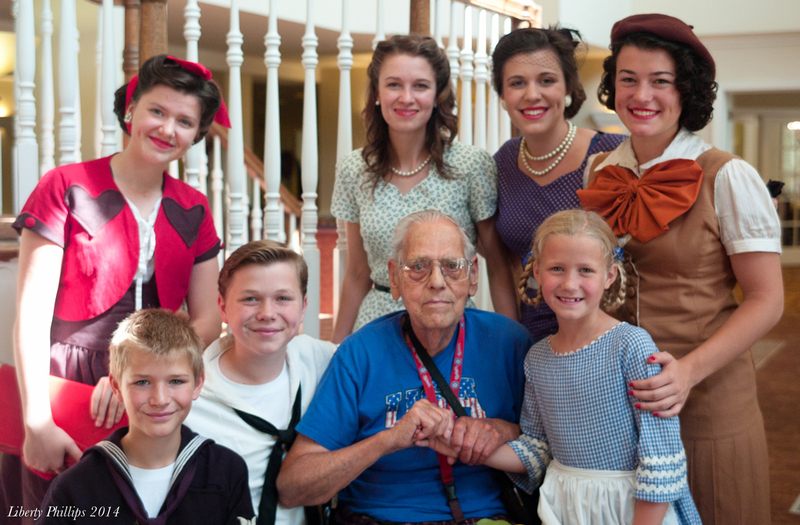 This very kind Pearl Harbor veteran put his arms around my brothers and sisters and hugged them, sharing his own memorable stories and letting us know how much he delighted to be around children. Mr. Dove loved the children. Today is Pearl Harbor Day, the 73rd anniversary of a date that will be forever remembered as “a day which will live in infamy.” Our friends Mr. Porter, Mr. Schlemmer, and Mr. Dove have now passed away, and they are not the only ones. Their faces and their stories are forever in our memory. I remember them as gallant older men who talked as if they had the hearts of boys. But I picture them as the young men which they once were, who had to assume an uncommon maturity well beyond their years. Today as I think of them, I consider it a great honor to have met and now be able to share their names with you. I was hardly fifteen years old in 2011 in a sea of more than a thousand people, hundreds of whom had been survived the attack at Pearl Harbor. For many of these frail men, it seemed as if the finality of the occasion brought some form of relief. It was time for someone else to remember and tell the stories. It was a long journey for America from December 7, 1941 to September 2, 1945. For nearly four terrible years America was at war with the world. Here we are now, just days away from the 70th anniversary of the Battle of the Bulge, months away from the 70th anniversary of Iwo Jima, and only 6 months from VE Day. I don’t feel the relief experienced by some of these aging heroes. I feel urgency because of the ever narrowing window of opportunity to see their faces and hear their stories. This morning I was shocked to read of the death of Mr. Louis Zamperini. You see, in God’s amazing providential timing, I just finished reading the biography on his life Unbroken by Laura Hillenbrand last week, and not a day has gone by that I have not thought about his story. The story of his life is one I will never forget. After spending his mischievous childhood and youth stealing and getting chased by police, Zamperini eventually channelled his energy into running. Soon he was setting records and ended up in the 1936 Olympics in Berlin, Germany. Louie, fondly known by his friends and town as the "Torrance Tornado". Then came World War II. Zamperini served as a bombardier in the Pacific on a B-24 aircraft. After multiple noteworthy bombing raids, in 1943, he crashed in the ocean while on a rescue mission. He survived 46 days in a little raft subsisting on shockingly little to eat and drink. His only companions were the pilot and one crewman who later died, not to mention the ever present sharks that circled the raft. Finally on day 47, the last survivors of the plane crash, Russell Allen Phillips and Louis Zamperini, arrived at the Marshall Islands and were quickly captured by the Japanese. Already in very bad health after almost 7 weeks on a raft, Zamperini weighed in at a pitiful 79 pounds, less than half his original body weight. He and his pilot were taken to various prison camps where they endured experimentation and incessant beatings. One man in particular, whom the prisoners nicknamed “The Bird,” found it his mission to torment and beat the Olympic athlete constantly. The torture inflicted by this sadistic corporal shaped his life for years afterward. Finally in 1945, when the war ended, his trials as a prisoner of war were over. Louis Zamperini returned home and was hugged and kissed by his family for the first time in close to three years. Louie, reunited with his family after years of separation, is warmly embraced by his loving mother and father. Louie with Billie Graham in the 50s. But then one day Louis Zamperini’s true liberation came. At a Billy Graham revival in Los Angeles, he remembered a promise he made on the raft years before. He had told God that if God got him out alive that he would serve Him for the rest of his life. Zamperini was physically liberated years before when the war ended, but his real freedom came when the gave his life to Jesus Christ. He went home that night, poured out his bottles of alcohol which had become his nightly companion to drown his memories, went to bed, and never dreamed of “The Bird” again. Many years later, Louie would return to Japan and meet with the men who had tortured him during the war. To me, that is a true success story. Freed from drunkenness, freed from his flashbacks and nightmares, freed from hatred for his enemies, Zamperini returned to Japan in the early 1950s. He went to Sugamo Prison where Japanese war criminals were held. He found his previous captors and persecutors and told them he forgave them for all they had done to him. While he never had face to face closure with “The Bird,” Zamperini was at peace. What I have just given you is a very, very rough sketch of the life of such an extraordinary man. I would really like to encourage all of you to read the biography on his life. It is one you cannot possibly read with out coming away impacted! I for one have been heavily reminded of the power of God’s saving grace and the freedom it brings to those who have endured some of life’s hardest trials. Mr. Zamperini could have lived out the rest of his life in misery like so many others, but because of the beautiful work of Christ in his heart, he lived out a full life of 97 years and used his story to impact the lives of countless others. You may have seen it in the news this past week: WWII veteran Jack Schlegal, renowned for having shared a beer with Patton after having his purple heart pinned on, passed away just days after returning from France for the 70th anniversary of DDay. But there have been many others as well: 93 year-old Roy Rowbotham of the Royal Artillery, one of York’s “Magnificent Seven”, 89 year-old Harry Chappell of Barnsley England, and 89 year-old Charlie St. Germain of Canada whose older brother was killed in Italy in 1944. Each of these men died within days of coming home; Charlie didn't even make it home. He died in a hospital in France. After reading the articles about these losses, I am more firmly convinced than ever of the shortness of the time we have left with these men. It is estimated that between 400 to 500 veterans die every day. Those are not numbers. Those are four hundred individuals who fought for you and for me, shed blood for us and have now passed away into eternity. Four hundred different stories of sacrifice made which will never again be able to be repeated. Four hundred men to whom it is too late to say, “Thank you.” And all this is happening every single day. "Rest my dear one, you task is done. You died for your country and it has won." The grave of S.H.R. 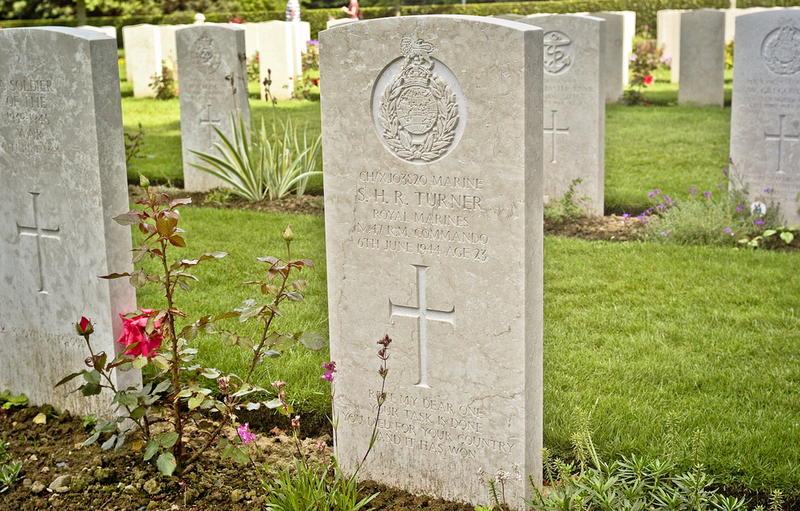 Turner at the British War Cemetery in Bayeux. I don’t mean to sound dramatic, but this is so important to me. I did some rough calculating based off of the last World War I veterans, and I estimated that in the next 10 years, almost all of the World War II veterans will have passed away. In 15 years, there will be just a few dozen at most still alive, and in approximately 20 years, we will be able to count the remaining veterans on one hand. This may sound like plenty of time to some, but for me it isn't. I am 17 years old now. When I am 30, I will have to search very hard to find any World War II veterans that are still with us. Only 30 years old and after that -gone for ever. 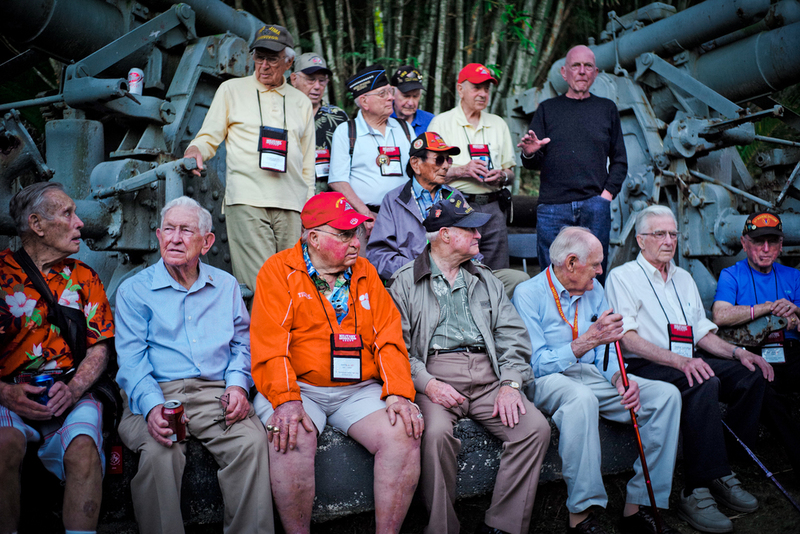 There will be no direct link left to those known as the “Greatest Generation." The grave of Texan Lieutenant John D. English, 751st Bomb Squadron at Omaha Cemetery. If I sound a bit on the depressing side, it’s only to plead with you to take every opportunity you have of connecting with this last link. We don’t have anyone left from the “War to End All Wars,” World War I. There is no one left who can give a first hand account of what really happened. My children are going to grow up in a world where they will never have the chance to thank the men who shed blood for them on the beaches of Normandy. "The King called. He answered. The King of Kings called. He answered." Grave of C.E.A Cox at the British War Cemetery in Bayeux. So here is my plea, in honor of all the men who fought for us: some who died many years ago, and some who are still here to tell their stories, please find the veterans near you and talk to them. Ask them questions. Record their voices. Write down their stories. Because soon, too soon, it will only be a memory. Virginia writes down the names of our fallen heroes at Omaha Beach Cemetery.